HMH Books for Young Readers, 9780544805095, 320pp. Eileen Cook is a multi-published author with her novels appearing in eight different languages. She spent most of her teen years wishing she were someone else or somewhere else, which is great training for a writer. Eileen lives in Vancouver with her two very naughty dogs and no longer wishes to be anyone or anywhere else. "Prepare for lots of twists, right up until the very last chapter." * "Cinematic scene breaks and propulsive reveals will keep the pages furiously turning in this slow-burning but explosive thriller." 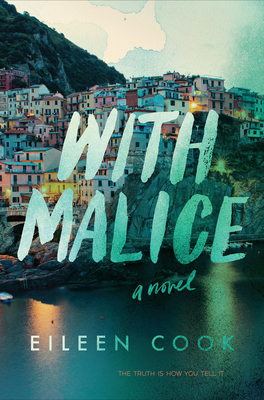 "[With Malice] is a page-turner, and the ending is unsettling—let the reader beware." "A solid thriller that will leave readers guessing until the very last page." "Cook believably portrays the struggles of girl who had it all and is left to pick up the pieces of a life she isn’t sure is hers." "The hoopla surrounding the accident is played well, reminiscent of the real-life Amanda Knox trial. Jill's past-tense narration is complemented by Justice for Simone blog posts, police transcripts, text messages, email, Facebook comments, and Crime Watch episodes, through which details of their frenemy-ship and what might've happened emerge."